I knew from reading previous reviews, the labelling of the disks was going to be a pain. And since I did not have the projector right away (had the entire system minus the projector for 2 weeks), I wanted to be able to load the disk player and listen to audio disks - get familiar with the unit. 1) My number 1 gripe was being able to access a disk directly using the remote. For instance, if I am listening to disk 50 and what to go to disk 200, there are 3 ways of doing this a) stand up off the couch, walk over to the unit and use the shuffle dial to select that disk, b) hit the disk skip button on the remote 150 times!, c) turn on your projector, hit the "folder" button on the remote and scroll down the list and play disk 200. I find this a real pain in the arse, as I had no video on the system, didnt want to get up (not very effective routine anyways) or hit a button 150 times. I would like to be able to type "200" into the remote and press play. The unit does not support this feature! Confirmed by Sony Tech support engineers! 2) disk lableling. This is just a retarded system. The unit only auto labels sony disks. Out of 300 or so disks I initially loaded, that maybe is 20 in my collection. These guys should provide a network jack on the unit so as I can plug it into the internet and the device looks up the cd info must like xp media player or winamp or musicmatch juke box. I would rather answer a couple questions that way versus having to type in all the disk info! 6) sometimes to shuffle 20 disks for example, the carosel spins 1/2 way one way then back then entire distance.. like its lost! Strange. 7) sacd - cant use hdmi to listen to them. Copyright protection or something like that. Had to purchase patch cables and connect. Still does not work properly. Only front left and right speakers work. Gave up on the routine. Too much work for all of 3 sacds I have. 9) onscreen disk catalouge. By default it shows album name then artist. You can change the order, but it pops back. I have a cd rack sorted by artist not by album. I cant beleive it does this... perhaps I am missing something in the config of the unit. 10) I have a few disks with do not play. Player displays "CANNOT PLAY" in display and skips to next disk. Looking at the disk, it has some enhanced content which you can use your computer to view. Too bad - I really like 1 of those disks. I cut this review short as I hit post and it errored on posting! Good thing I copied the wesknesses before hitting post! Even with the complaints I love this device and would di it again! 2) Quiet machanics. Barely hear it from 15 feet in total quiet room. Just finished reno'ing my basement. Full blown theatre with 135 inch projection HD 1080p/i Panasonic. Denon reciever with 3 hdmi inputs and 1 hdmi output. Everything is 1080p/i. I researched long and hard on this disk player as I have spent considerable time and money on the remainder of the system. Wanted to take full advantage of the entire system. Was real close to not buying the unit, but the 400 disks loaded at one time is hard to resist! Read on but let me say right now, if I had to do it again knowing what I know now, I still would purchase the unit. I would however, like to see sony read this and update the hardware for next years release! Sony tech support via telephone were fast and freindly. Granted they did not have the answer to my questions immediatly, they did call back the next day as promised after talking with "the engineers". Had an inside contact to a Sony tech. Took him days to get back. Following the channels as on the website works best. Never had a DVD player with more than 1 disk at a time - using svideo with fiber optic audio. I have never experienced any problems with digital audio from the player. Also, I can't get SACD surround sound, as the analog inputs on my preamplifier are two channel (stereo) only. (5.1 surround output needs six inputs). I really wish Sony would get their act together and make digital output standard for all SACD playback. Currently a few of the ES receivers have iLink inputs for digital SACD playback, and only a few ES models of single disc players have iLink output. Having to use analog audio connections between components is far from ideal, and vastly limits the potential of this audio format. The HDMI upscaling on my DVP-CX995V does not work, period. The reason why ? Because it is connected to a Sony high definition screen (PFM-42X1/B) using HDMI output from the player into a DVI input on the display. The player recognizes an HDMI connection, but will only output 640p. Even the Disk Explorer menu is displayed as 4:3 on a 16:9 screen (automatically switching between 16:9 and 4:3 for DVD movie playback does work). Calling Sony support didn't provide a solution. The thing that really worries me is that Sony are moving towards HDMI output on all of their consumer video products, and it is highly likely that they won't work with DVI either. I purchased the Sony DVP-CX995V to replace our older DVP-CX985V. For us, the main differences between the two were the reasons for upgrading to the newer model; digital HDMI video output with upscaling of DVD movies to high-definition, the new version of Sony's Disc Explorer, and 192kHz/24-bit audio D/A converter (the same specification as the DVP-CX777ES model) for SACD playback. The new Disc Explorer is faster, mainly because it does not display the jacket cover pictures for each disc in the main menu as did the previous versions. Other than that the two players are fairly similar. Video and digital audio quality is very good (I'm using an HDMI-DVI cable for the video and a high quality DH Labs D-75 coaxial cable for the digital audio). The player also plays back JPEG pictures and MP3 audio (burnt onto CD-R discs in this case). MP3 audio is output as 44.1 kHz PCM. The DVP-CX995V does not have any external control ports (such as Sony Control S or Control A1II). 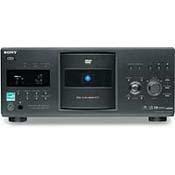 - SACD (Super Audio Compact Disc) playback is analog output only. - DVD-audio discs cannot be played. This model, like most others, cannot play the second side of a dual-sided DVD disc (the only model which did this was the now discontinued DVP-CX875P). The majority of DVD video discs do not have title information (which is displayed in the Disc Explorer menu). For this you will have to type in the information by attaching a keyboard to the player. This can be tedious if you have a large number of DVD movies, but it works very well. I have never experienced loosing the title information which I have entered. All of the SACD discs we own already have title information on the disc. For discs which do contain title information, the text cannot be edited. Actually, out of the four Sony DVD magachangers we have owned, I by far preferred the design of the DVP-CX875P to the other models. Auto Play. Load time could be quicker. Having owned at least 8 different Sony players over the years, I have got to say considering the price paid, this unit is pretty swell. While there are is always the fear of the Navigator going mental, so far only a few titles have been lost to the ghost in the machine. Video wise, I think it looks quite good if not the equal of the Denon players. Layer changes have improved considerably over prior Sony offerings. The Disc Navigator is way better than the previous generation megachanger. The player is quiet to boot. On the annoying side, the player always auto starts. i.e When the player is first powered, the player must load and start the last title viewed before you can go to the title you intend to watch. Annoying but not fatal. Load time could be better but it is not as bad as I have heard others whine about. All in all, an insane amount of entertainment for a reasonable price. I purchased mine local given all of the potential problems intrinsic to megachanger. I figured just the shipping if warranty work was needed would offset the difference in price. C.C ships warranty work for free. Sony DVP-NC555ES Sony DVP-S9000ES DVP-NC650V DVP-NS900V DVP-NS500V Denon DVD-2900 DVP-S7000 And sadly many more. The interface is just too cumbersome and lacks capabilities that are required for the use and enjoyment for this type of product. Slow and quirky. Not really a weakness but be sure your cabinent or shelving is strong and large enough. The unit is over 21 inches deep. With video component cables extended out the back, you should allow at least another 1-2 inches. Think about how heavy 400 DVD/CD discs weigh and add-in the weight of the player. The Sony DVP-CX995V. Hmmm. Let's get the obvious out of the way. Yes. It will play your movies, your CD's and MP3's. The picture and sound is more than acceptable. Yes. It will hold a lot of discs in a relatively compact space and eliminate clutter in your A/V / Home Theater Room. Saying that, the product falls short of being truly usable its intended purpose. The interface is horrific...and that is coming from a confirmed gadget geek who loves to play with the latest electronic wonders. I am very disappointed that Sony would put a product like this on the market. Some of the simplest things you would expect of DVP-CX995V are missing. For example, it would seem obvious that with 400 discs, there would be some quick and efficient method to select a disc such as keying in the disc slot from the keypad. Wrong. You either manually turn the disc skip control on the unit, or repeatedly press the "disc skip" on the remote while the player sequential spins the carousel (or repeatedly paging through screens of titles on a television). Thankfully, on the player there is a button that allows you to skip 100 discs at a time so that you only have to manually go forward or backward, may be 50 slots. Yes. It is that primitive. The unit does not allow you to enter and save programs for favorite CD's. The closest you can do is to categorize the discs by artist, genre, etc and then select that group to play. This information needs to be keyed into the player. However, a disc (slot) can only be assigned to one category. This leads to the next item. The highly touted ability to enter and create a library of title information is flawed because the player loses its memory if it is without power for less than 24 hours. I live in Florida...this is an issue. Even if you live in an area which has stable power, what if you want to move or unplug the unit? It boggles my mind that in an era when you can buy 128MB of non-volatile flash memory for less than $20, why does this unit have this problem?. By the way, the DVP-CX995V is s-l-o-w to mount and read a disc. Forget about shuffle play of tracks between CD discs. I was disappointed to learn that this player will not read MP3's from DVD media like the other current Sony players do. Given the slowness of the unit, it would be nice to collapse 30 or 40 albums of music onto a single DVD but it is not there. Yes, the player forces you to wait 20-30 seconds upon startup while it loads and reads the information from the last disc played....whether you want to play it or not. This is such a simple bug...why doesn't Sony fix it. Yes. You will need to read the manual. This must be the least intuitive machine I have ever used. "Steep learning curve" would be an understatement. After playing with it for over a week, I don't understand what Sony was thinking about when they designed the DVP-CS995V. It doesn't have to be this hard. Prior to buying this player, I read some of the negative reviews and thought they were written by the sort of person who gets confused setting up a VCR or using a remote control. Well, I was wrong. In fact, I don't understand the positive reviews that you will find listed. Bottom line. Unless you must have a player that can store 400 pieces of media, avoid the DVP-CX995V. Save your money and peace of mind. You will thank me. Hear me now...believe me later. None...this is a niche product.